Magnificent! I watched the video several times. Thanks for sharing! 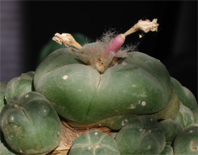 and what happened with that lophophora you wanted to dissect? is it still alive? He, he, I should have expected that bold statement to be thrown right back at me ;-) Faced with the prospect of dissecting a healthy plant I didn't have the heart to do it, so yes, that plant is still very much alive. One of the other newly acquired L. diffusa plants caught rot, though, and I ended up transecting it to see if I could save a cutting (I couldn't, the plant died). I scanned the cut surface to document how the rot had spread but it is far from the detailed study I had envisioned. Since I wrote on dissecting plants, I have obtained a copy of the first section of the original 1927 edition of Alexandre Rouhier's book La plante qui fait les yeux émerveillés - Le Peyotl (Echinocactus Williamsii Lem.). 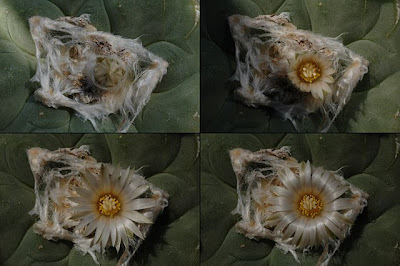 This book has very detailed information on the internal morphology of peyote (far, far better than anything I could come up with by slashing a few plants), so I'll probably do a post based on Rouhier's material and avoid maiming any of my own plants unnecessarily.